Joanna Lipper&apos;s The Supreme Price confronts both the corrupt culture and the limited opportunities for women in Nigeria. Viewing the nation&apos;s past and present from this standpoint, this study of human rights expands to all cultures and areas of the globe. Lipper&apos;s film will screen at the Human Rights Watch Film Festival on June 19, followed by a discussion with Lipper and the film&apos;s subject, Hafsat Abiola. FilmLinc asked the directors included in the upcoming Human Rights Watch Film Festival to give some insight on filmmaking and tackling issue-oriented work prior to the launch of the series on June 13. Description: Director Joanna Lipper elegantly explores past and present as she tells the remarkable story of Hafsat Abiola, daughter of Nigeria’s President M.K.O. Abiola who won a historic vote in 1993 that promised to end years of military dictatorship. Shortly after the election, Abiola was imprisoned and his victory annulled. His daughter, on the verge of graduating from Harvard, decided to return home and join her parents’ struggle. Through Hafsat’s family’s story, we see the evolution of the pro-democracy movement in Nigeria, and Hafsat herself continues to face the challenge of transforming a corrupt culture of governance into a democracy capable of serving Nigeria&apos;s most marginalized population: women. As a film director, I have a particular interest in films about complex, multifaceted women who defy expectations and create their own destinies rather than surrendering to circumstances. I first encountered Hafsat Abiola over a decade ago at an event organized to raise awareness of her endeavor to build Kudirat Initiative for Democracy (KIND). 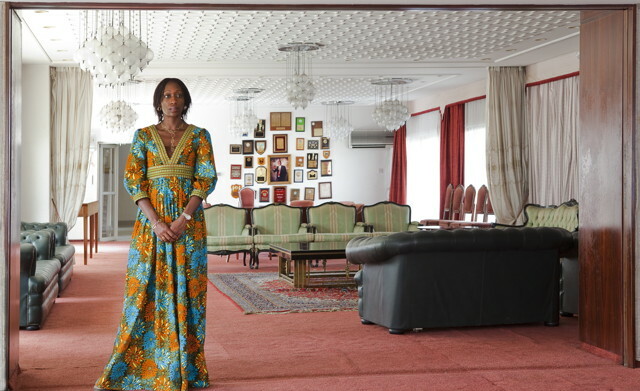 Hafsat created this organization intending to honor her mother’s legacy by educating and empowering women in Nigeria with the goal of increasing their participation in politics and inspiring them to pursue leadership roles. When Hafsat stood up and told her family’s tragic story, I was impressed by the way she channeled her rage and mourning into determination, tenacity, and activism, calling upon knowledge, integrity, courage, and persistence to oppose corruption and senseless violence. Instead of being a victim of circumstances, Hafsat became an agent of change. While making this film, I saw the opportunity to tell the story of Nigeria’s political evolution from independence in 1960 to the present with an emphasis on women’s roles, sacrifices and vital contributions. Two of my absolute favorite films are Bernardo Bertolucci’s The Last Emperor and Alan Resnais&apos;s Hiroshima, mon amour. I greatly admire the way those two films situate individual characters against sweeping historical and global contexts at pivotal points of crisis, trauma, political upheaval, and transition. As I made this documentary and studied the archival footage along with my footage of contemporary Nigeria, I saw clearly how the Abiola family’s story connects inextricably to Nigeria’s ongoing struggle for true democracy, transparent and accountable governance, and protection of human rights. As a lecturer at Harvard, I teach “Using Film for Social Change” so this is a question I think about all the time as I work with my students. A good film that promotes activism links the subject(s) depicted to the filmmaker and then to the audience, provoking them to use the story told on screen as a catalyst to reflect on their own lives and experiences; encouraging them to re-examine their roles in their families and communities; and compelling them to re-assess their unique place in the world at large and their individual capacity for positive impact where it is most needed. The medium of film has the power to combat stigma, stereotypes, and ignorance by putting viewers inside the minds, emotions, perspectives, and experience of characters who are geographically distant and culturally diverse. Films can take viewers on journeys through time and space to foreign countries that they may not ever have the chance to otherwise travel to and experience. Films can transcend economic class boundaries, presenting insight into lives that unfold both with and without adequate resources. Films can present in-depth characters in ways that open new paths toward empathy, identification, and compassion that were once closed. Documentaries can be highly effective educational tools, presenting the history of a very complex country like Nigeria in a variety of compelling and accessible ways, including firsthand accounts; animated graphics and maps; expert commentary and analysis; and, perhaps most importantly, through archival footage that breathes life into the past. Filmmakers can inspire activism by presenting unforgettable images and gripping stories that leave indelible imprints on the minds of audience members making it impossible for them to dismiss, ignore or fail to notice the plights of other human beings who are struggling, questioning, revolutionizing, discovering, building, working, educating, fighting, suffering, giving birth, living, dying, and surviving. The many challenges inherent for me as an American woman producing and directing a film on the ground in Nigeria were mediated by the warm welcome, guidance, hospitality, security, and support I received from my Nigerian collaborators. Hafsat Abiola connected me with production manager Steve Aborisade, who introduced me to Nollywood filmmaker, Tunde Kelani, a longtime friend of Hafsat and her family. Tunde championed my work on the project and introduced me to members of the local filmmaking community. He offered me access to his production office, equipment, and personnel at Mainframe Productions and came on board as co-producer. Rasheed Owonifari, Head of Finance & Operations at KIND, helped me navigate Nigeria’s cash economy and made sure all production costs were accounted for. Without this dedicated Nigerian team working in collaboration with me over a period of several years—making this film would have been impossible. I encountered additional challenges in the editing room as I set out to tell the intergenerational story of the Abiola family&apos;s epic rise and fall unfolding against the historical backdrop of Nigeria’s evolution from independence in 1960, through the Biafra War, subsequent military dictatorships, and the tumultuous transition to civilian rule to present-day. In constructing the historical sections of the film I relied on archival footage gathered from a vast array of sources on three continents. During Abacha’s military regime, Nigerian media was highly censored. To get around the censorship, international news organizations hired Nigerian cameramen, then smuggled their footage out of the country. This footage was digitized, well-preserved, catalogued, and easily obtained. I was also able to obtain some archival amateur footage from that period via Witness, a human rights organization that distributes cameras to civilians so they can document human rights violations as they are occurring. However, some of the key footage of Kudirat and MKO Abiola on the campaign trail during the 1993 election was not found in any archive and might never have reached any audience at all. It came from the home of the Nigerian cameraman who had accompanied the Abiola delegation on the campaign trail in Northern Nigeria in cities like Maiduguri and Kano as well as in the South. His hours and hours of VHS tapes had not been copied, logged, or labeled and were in rough shape. I worked with my team to have them transferred and restored so that this historic campaign, these charismatic leaders and the Nigerian masses from that moment in time could be preserved and brought to life on film. The “take away” from this film is the urgent immediate need for global solidarity when it comes to empowering women to be leaders in local communities and on the state and federal levels. This requires more equal opportunities for women to enter politics and occupy elected positions of power and influence not just in Nigeria but also in countries like the United States where women are underrepresented at every level of the political system. We have established partnerships with Vital Voices, Women for Women International, and Gucci’s Chime for Change. Audience Members who are inspired to participate and make a difference after seeing the film can donate to these organizations that are dedicated to empowering women and girls.